- Andy has tremendous phenotype blended with fleshing ability, soundness and maternal power. - He is the outcross horned option on the market today. 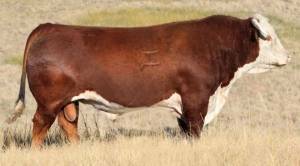 - Whether you are making show heifers, range bulls or replacement heifers, Andy needs to be in your breeding program.